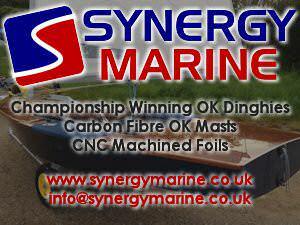 Latest updates will be published both on Royal Varuna Yacht Club website and on the Twitter feed of the association. 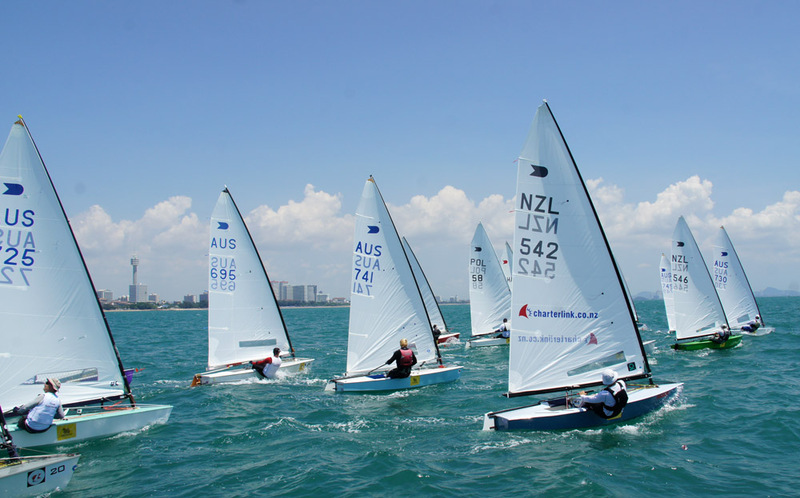 OK Dinghy sailors from around the world are gathering in Pattaya, Thailand for the 2013 Singha OK Dinghy World Championship, which gets under way at the end of this week. Seven containers have arrived at the club over the last few weeks with 72 boats from nine countries entered for the championship. 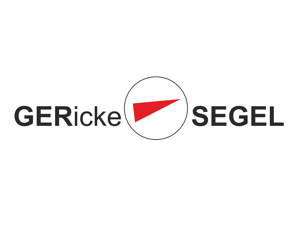 The first race is scheduled for Sunday 31 March. 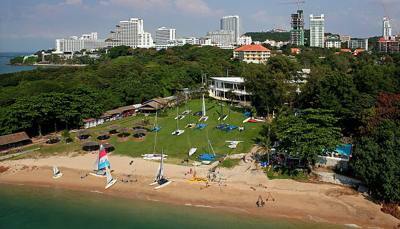 The fabulous weather continued in Pattaya, Thailand as the practice race of the Singha OK Dinghy World Championships was held at the Royal Varuna Yacht Club today. 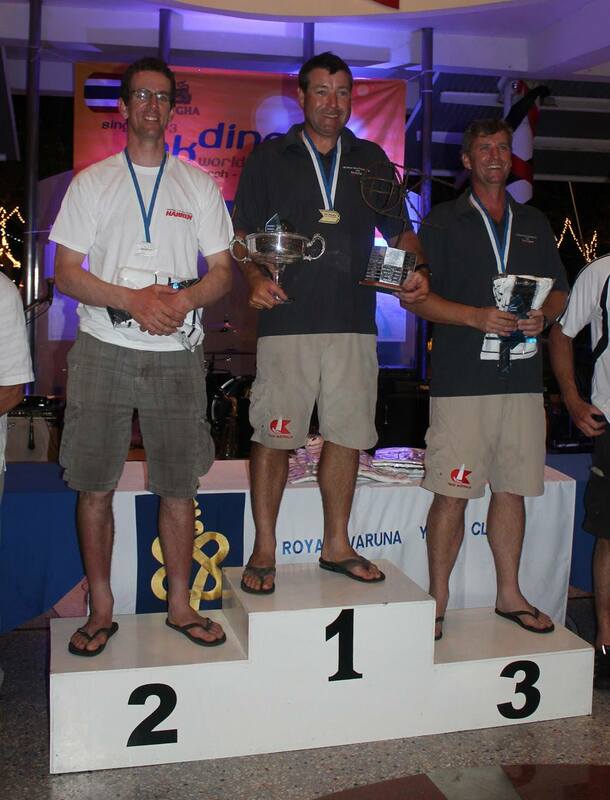 Roger Blasse (AUS) the 1998 World Champion took the race win from Mike Williams (AUS) and Andre Budzien (GER). After a thorough morning briefing by PRO Kevin Wilson (AUS), the sailors enjoyed a taster of the awesome week that hopefully lies ahead. But departing from tradition, the conditions were so good that most of the fleet completed the race. They came ashore exhausted but very happy they had made the decision to travel to Pattaya. 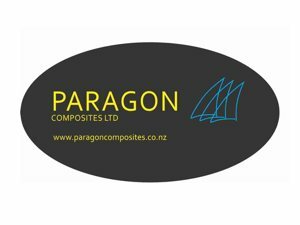 The principal sponsor Singha is not only providing evening refreshments, but also cold water bottles as the sailors go afloat, with further supplies available on race management boats. Stating hydrated is going to be crucial for success here. The practice race started in 15-16 knots with the fleet evenly spread over the course. At the top mark Andre Budzien (GER) led from Paul Rhodes (NZL), and Stefan Myralf (DEN), all from the left. The leading boat from the right was Roger Blasse (AUS) in fifth, though he was not far behind. Blasse was the first to spot the wing mark on a fairly tight reach and rounded overlapped with Budzien. The overlap continued at the leeward mark but on the second upwind Budzien takd away early while Blasse and Williams took the advantage on the right. Positions stayed the same with Blasse winning by about 10 boatlengths at the finish. 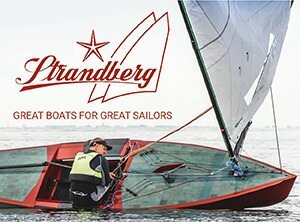 Racing for real begins tomorrow with the course area a 20 minute sail from the club. Launching is made much easier by the club's boatmen who look after trolleys and even lift boats out of the surf on arrival back at the beach. 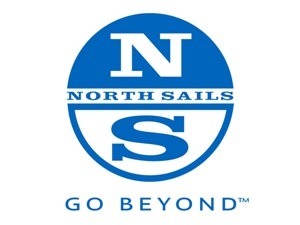 Their helpful and enthusiastic attitude is typical of everyone in the club as they try to make sure the sailors every need is catered for, both on and off the water. 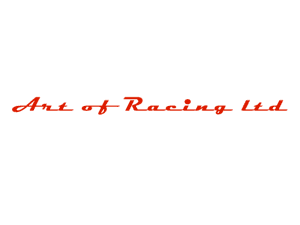 Racing gets under way Sunday with two races each day from 13.00,until Friday when it is from 11.00. 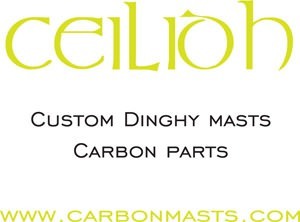 This could get monotonous. 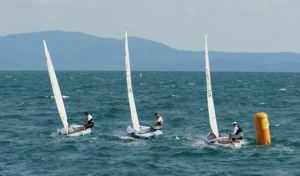 Another day of perfect conditions greeted the 70 sailors at the Singha OK Dinghy World Championships in Pattaya,Thailand. 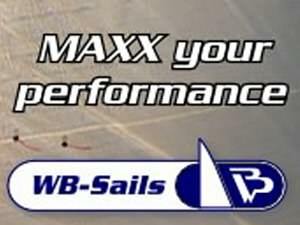 The first two races was staged in a 12-18 knot hot breeze with race wins going to defending champion Andre Budzien (GER) and Roger Blasse (AUS). The breeze built during the day to end with a leg stretching 18 knots by the finish of the second race. Tonight Royal Varuna Yacht Club is full of very tired by satisfied sailors as they enjoy the spectacular view over the Gulf of Thailand and the free refreshments provided by Singha. Race one got under way under the new 'U' flag with three boats pulled out on the restart. Paul Rhodes (NZL) rounded the top mark first from the left from a group consisting of Andre Budzien, Roger Blasse and Nick Craig (GBR). Rhodes overlaid the second top mark after overestimating the tide and let Budzien through. The laylines were hard to call with big courses and the left paying well. The German dominated the rest of the race with Craig pulling up behind Blasse at the finish. Both thought Craig had done enough, but Blasse took third. Practice race winner Blasse took the early lead in race two and with a change of tide the course turned into a one way track with the left very clearly favoured. 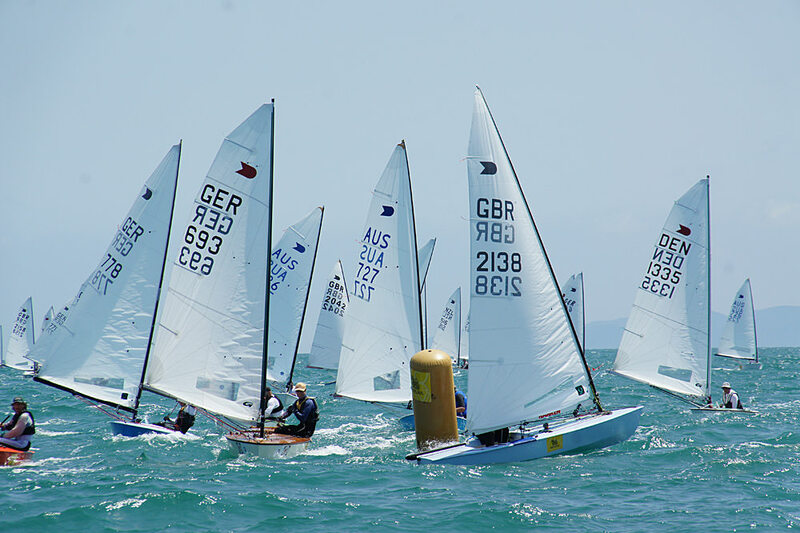 He was closely followed round th4 top mark by Mike Williams (AUS) and Jonathan Fish (GBR) as the wind increased to 15-16 knots and the upwind legs became hard work for some. Blasse pulled away downwind to lead throughout the race with Williams, Craig and Rhodes in close pursuit, though they finished in that order. Two more race are scheduled for Monday at 13.00 before the fleet enjoys a lay day on Tuesday to sample the delights of Pattaya. 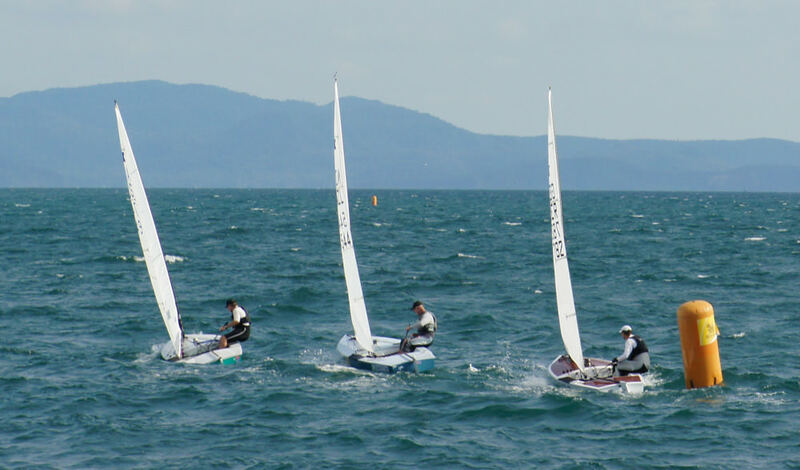 It was more of the same on day two at the Singha OK Dinghy World Championships in Pattaya, Thailand with slightly less wind and tide making the racinge3xciting and close. Race wins went to Nick Craig (GBR) and Mike Williams (AUS) though Roger Blasse (AUS) continues to lead overall. Race three started after a few recalls as the ebb tide pushed the fleet over the line. Soon after the start Nick Craig tacked on a left shift and crossed the fleet to lay the top mark perfectly as more than half the fleet overstood and ended up reaching back. Craig extended away though Andre Budzien (GER) and Roger Blasse closed up at the gate. Budzien briefly took the lead by rounding the opposite gate, but Craig held on until the wind came back in his favour and in the fight to the finish, took the win from Blasse and Budzien. Race two started on the flood tide with the leaders coming in from the left, Mike Williams timed it perfectly to lead round and extend on each leg for a magnificent win. The chasing pack included Craig, Jonathan Fish (GBR), Paul Rhodes (NZL), Greg Wilcox (NZL), Blasse and Budzien. On the second beat Blasse went hard left and got through to third behind Budzien, though it was all change on he final beat and Blasse moved up to third and Craig hit the left again to end a great day with a third, while Budzien was disqualified as OCS. Williams commented, “The winds are bit more than expected, so that suits us Aussies, and it's good to see four of us in the top 10.The tide is playing a big part but there was a wind shift to the left in the second race that was too big to ignore. I had to tack on it, and that was pretty much it. 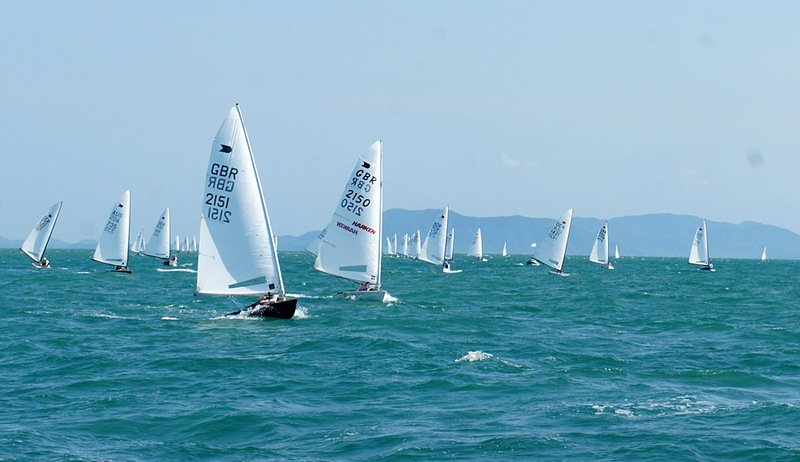 With four tough races completed the fleet can now enjoy a lay day on Tuesday, with various activities and entertainments organised in and around Pattaya tonight and on Tuesday. Those that survive will continue racing on Wednesday, though some will be using the time to recover energy ready for the final six races. The championship concludes on Friday. 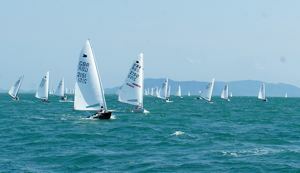 As racing resumed at the Singha OK Dinghy world championship in Pattaya, Thailand, defending champion Andre Budzien (GER) won the day with a first and second to move up to second overall. Roger Blasse (AUS) remains in second after a second and a third while the winner of the second race today, Mike Williams (AUS) moves up to third. It was also a day of drama. The day afloat began with some spectacular launching through heavy surf that had built as a result of the strengthening wind, and without the help of the club's boatmen this would have been an impossible task. The day ended with drama as defending champion Budzien picked up his second yellow flag to effectively end his championship chances. Blasse is now in pole position to take his second world title, 15 years after he first won it in 1998. Andre Budzien continued his good form from Wednesday into race seven taking the lead on the first upwind and maintaining it throughout. Bo Pettersen (DEN) spent most of the race in second as did Jorgen Svendsen (DEN) in third. Championship leader Roger Blasse crossed in fifth behind Nick Craig (GBR), while Blasse's main competition Mike Williams (AUS) was struggling way back in 50th after his rudder fell off. Williams returned to the front in race eight leading Budzien into the top mark and sailed away to win his third race of the week. Blasse rounded further back but fought through to the front and it was here while he was fighting hard downwind with Budzien that the German got his second yellow flag from the jury and had to retire from the race. Blasse couldn't catch Williams but crossed second while Svendsen picked up his second third place of the day to move up to eighth overall. By this time it was looking like only one race was possible within the time limit, so Blasse didn't actually need sail, but he got a great start and dominated the first beat to lead round from Budzien. The two battled round the course only for Budzien to take the lead in the closing stages for his fourth race win of the week. Blasse crossed in second with Jorgen Svendsen (DEN) in third again. At the prizegiving tonight Roger Blasse paid tribute to the club, it's staff, the event fantastic sponsor Singha and summed up everyone's thoughts by saying, “This club is a hidden gem; it's been an absolutely fantastic week.” There was also a genuine feeling that the sailors wanted to return to Pattaya in the not to distant future for another championship.